Profit Rhino has a plethora of tasks for you to use and customize. Even though we have a lot of tasks in the book it may not cover everything you are currently doing. You may have a side business such as roofing, landscaping, or garage doors. These are tasks that you will not find within Profit Rhino but that doesn't mean you can't use Profit Rhino for these other businesses. By now you have most likely learned how to create tasks and categories within the Profit Rhino web tool, but if you happen to have a price book built out for that other business already you may be able to save a lot of time getting those tasks in by using our task import template. Once you fill this out using the help of this article please send the completed template to support@profitrhino.com and a CSA will help get the file imported in for you. 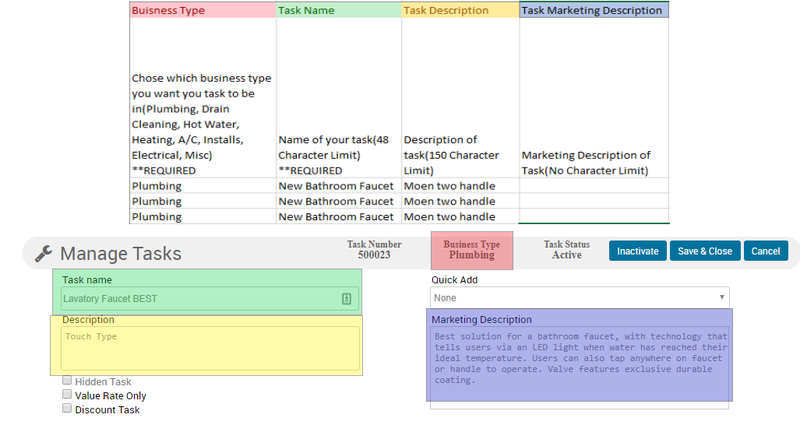 Red - Task Type Time and Material - REQUIRED - If you want your task to be calculated out based off of the time it takes to preform the task at your bill out rate, and the materials associated with the task marked up according to your markup scale mark as "Yes". 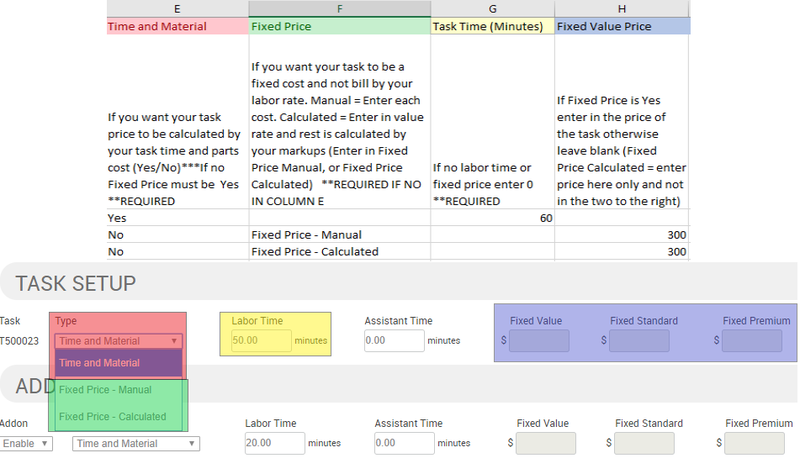 If you want to price your task as just a flat number enter "No"
Green - Task Type Fixed Price - Required if "No" in the Time and Material Column - This will allow you to set if you would like to manually enter in the task pricing for each your value, standard and premium pricing or if you would like to just enter the value rate and have the standard and premium calculated for you based on your markups. For manual entry of each pricing column enter "Fixed Price - Manual" for the standard and premium to be calculated for you enter "Fixed Price - Calculated"